M4Photo – The end of the road. I have finally finally reached the end of the road with my event photo journey and it is with the heaviest of heavy hearts that I’ll be saying goodbye to M4Photo. I have thoroughly enjoyed making some lasting memories for many people and it has been a long and very heard decision, but the time to close has come, from both an economical and from a legislation point of view, to let it go. With the advances in mobile phone and iPad cameras and low cost DSLR cameras, people have more and more access to capturing their own images for next to no cost. People simply want to share those images online and fewer and fewer people want to pay for prints, quality is just of interest any longer for most parents. With the rising costs of insurance and other business critical expenses, I find that the few clubs that I support are no longer buying enough images and it’s becoming a financial burden and too costly for the hobby business that it was designed to be. Furthermore, with current changes to legislation (most notably GDPR), more and more clubs and schools are banning cameras from their venues. Under GDPR, photographs are now being classed as Personal Data and therefore their use and storage is now also becoming more problematic with permissions being required and validation of those permissions for each image. Something that is not overly easy when you don’t know the club or school members and therefore find it near impossible to marry permission slips to specific individual images. In addition, it is now very difficult under GDPR to sell digital images to a parent where the image contains their child and another child. This makes the nature of my photography very hard to deal with. In acro gymnastics, children are usually paired with other family’s children. In archery, there is always another person of child in the image, in team sports there is always one on one action, the list goes on and on. Many photographers who rely on image sales to pay their mortgage and put food on the table, will have to battle around these burdensome regulations, or simply ignore them and apply the “Legitimate Business Use” rules. For many of us non-profit making traders who are looking to simply capture memories for people and to cover our costs of doing-so, these regulations are one more thing to worry about. Yes, I could have applied the “Legitimate Business Interest” rule and many professional photographers will do just that. M4Photo has always been run professionally and with protection and privacy in mind. But in the case of M4Photo, it’s just not worth me running the potential risk of the heavy fines and the personal time trying to stay one step of the regulations and ensuring compliance. I’ll therefore be putting my time to use elsewhere. So, last night was the Eclipse Gymnastics annual awards evening and I was invited along to take some photographs for the club and the gymnasts. The even has traditionally been held in the clubs hall at the Pemberton Centre, but this year it was moved to the Rushden and Higham Rugby Club. Now, I’m usually working with loads of room but very poor lighting, of the low light nature. Tonight things would turn on their head with a very small and very crowded room but with very harsh light. Let it not be said that things are never easy when you don’t have control of the light and conditions at these types of photo shoots. 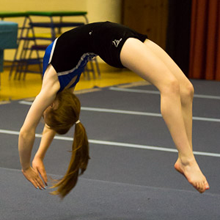 Anyway, the gallery is now online and Eclipse parents and gymnasts can gain access to the password protected gallery using the usual login details. Those details are available from the club officers only, so please don’t ask me for them. It is against my child protection policy and my agreement with the club to share the login details with anyone. I hope that the members enjoy the images and that they remain a lasting reminder of the stars and rising stars of the club. I was pleased to capture a few shots from today’s Archers of Raunds Fun shoot with archers from the club and also from SALT who came up from Milton Keynes for the morning. Unfortunately, I was rather too involved with the running of the shoot and finding time between making decisions and making sure that the shoot ran well, left little time for capturing some good images of the morning. I’ve been pretty quiet on the blog and Facebook recently but this is not through sitting around. Admittedly, things have been a little slow with local clubs recently and I’m running into the issue of cameras being banned from clubs more and more now. It seems to be a modern hurdle to get over as more and more club owners take child protection and other threats more and more seriously. Don;t get me wrong, this is a good thing and it’s one of the reasons why I set up M4Photo. I agree with uncontrolled cameras and video being an issue. People are all too ready to take images of everything and everyone and plaster them all over social media and this does have ramifications that people don’t care to think about. So, for 2017 my goal will be to try to work closer with clubs to enable them to make some extra funds and for me to create some invaluable memories for their members and families. It’ll be an uphill battle, but one that I believe is worth the fight. In the meantime, I was really pleased to recently write a commission cheque from the sales of photographs from a recent ‘very successful’ photoshoot. Better still I was pleased to hear that the £58.65 cheque will be finding it’s way to one of the amazing cancer charities. It is great to know that, along with creating some amazing memories for people, M4Photo is now also able to help clubs with their charity fund raising. For now though, I’m working on the challenge of getting some location photographs for a Lettings Agency website that I am working on and then I’ll be gearing up for the Eclipse Annual Show, which is becoming one of the highlights of my year. If you are associated with a club in the East Northamptonshire and North Bedfordshire region and you would like to find out more about how M4Photo can work with you to create some memories and generate some extra funds, please email martyn@m4photo.co.uk. I have been pretty busy of late and I’ve not managed to get out to do any reasonable photography, let alone even begin to plan a few shoots. What with the day job, a few M4Photo shoots and working in the garden, time has been somewhat limited. Even a recent trip to Lanzarote was hugely disappointing. Despite doing the hand luggage weight juggle because my camera bag was bang on 10kg with a 5kg limit on the plane, the island presented zero photo opportunities. The sky was either overcast and white, or sky blue without a cloud in the sky. Great for the sun bathers, but featureless for the camera. Despite a great location beneath on of the extinct volcanos, not once during the week were we presented with a typical sunset or sunrise that would lead to a reasonable shot. Even a trip up into the National Park did not present itself with any opportunities and the guide was moving us along too quickly anyway. Next time, it’ll need to be a car and a solo trip into the mountainous volcanic region of the island but this is another example of why you have to be patient with landscape photography and be ready to return again and again to get the right conditions. So with a distinct lack of new work to show off and a prolonged absence from Gurushots, I thought that I’d push up a few old images into one or two of the challenges. Nothing much to write about that but I had a few images entered which had been taken before my photography workshops with Paul Reiffer recently. It was interesting to see that the images taken before the workshops were doing OK but not really setting the world alight. I therefore decided to use the photograph swap feature of the website and swap out a couple of the older shots with some taken on the Paul Reiffer workshops – I have done two workshops now. WOW – what a change in fortunes. With the knowledge that Paul shares with us put to good use on the workshops and afterwards those swapped in images blitzed the older images in the voting stakes and I began to climb in the rankings. At the time of writing I have one of my images sitting in 5th place out of around 12,000 images. This will no doubt drop as better photographers join the challenge towards the end of the voting phase. However, I’m really pleased to see “Fractured Highway” sitting so high in the rankings. Especially as this was one of the images that I did not think of taking until Paul pulled over at the side of the road and told us to get out of the car and to look back down the road from where we had come. This was an image that I could so easily have missed, except for Paul’s experience and knowledge of the photo opportunities at the locations where he holds his workshops around the world. Another of the challenges featured a number of my older images and I was doing OK, but sitting around the middle rankings. I therefore swapped out most of the images for three taken on location with Paul and one taken in Paris shortly after one of his workshops. Almost immediately I began to climb the rankings and at the time of writing I am sitting in a lofty 29th place out of around 4,300 photographers. The Durdle Door image is sitting in 109th position out of around 17,000 images, which is not too bad and I hope to maybe break into the top 100 sometime over the next few days as the challenge draws to an end – fingers crossed. These Gurushots challenges are free to enter and I don’t enter to win anything because there are some really good photographers on the site. However, it is really nice to have real world photographers voting for my images and to gauge my progress in this hobby. It has also been enlightening to realise how important it is to get out there and shoot with other photographers who have great photography skills and who are prepared to share those with you. I used Karl Taylor’s videos in the early days of getting off of auto and onto manual, but it is Paul’s workshops that I believe have really helped me to get the most from my photography and I cannot recommend such workshops highly enough. Now I just need to find some time to get out there and shoot more. How often have I said that over the last year or so?? Disclaimer: I am not employed by Paul Reiffer nor am I a relative. I’m just impressed at his down to earth and hands on teaching style that has helped me to get some great results. I have been a little quiet on the blog of recent, not because I have been quiet, but more because I have been busy with a few freelance jobs that I am not able to talk about. A couple of them have been very large events and it is a real shame that I can’t mention them on my social media channels. Anyway, today I was off to Chloe G’s (surname withheld for child protection reasons) 16th birthday BBQ and a wonderful afternoon. The sun could have come out to make it a little nicer and warmer, but the food was fabulous (thanks to Graham for cooking) and the company was wonderful. I am getting used to taking the camera wherever I go these days and I was pleased to get a number of very nice shots of the family an friends during the afternoon. As usual, it was the natural, casual shots that got the most interest but Chloe is photogenic in both pose and non-pose situations. Thanks to Pauline and Graham for the invitation and a wonderful afternoon. Chloe’s password protected photograph gallery is now live and I hope that you enjoy the images. If you are a member of the family and you have the username and password, click here for the gallery. Well, my week of photography evenings at Eclipse Gymnastics is finally done, the squad shots have been taken and we have some more action shots from right across the club – the main tumble, acro and display squads are now all featured. The aim of these photographs are to mainly enable the gymnasts to see their shapes whilst undertaking moves. The images are now online and available from the usual Eclipse Gymnastics Photo Gallery (click the link to jump straight there but you’ll need the username and password to access the gallery). As well as publishing them online for easy access for gymnasts and parents to view them, I also plan on putting them on the big screen at the club during Tuesday’s tumble squad session. I’m not planning on doing the same at the other sessions during the week, so please let me know if you would like me to show them during another evening. As before, these pre-competition images are free to order prior to the competition day. From Saturday onwards, all of the photographs will be available to order in digital and print formats at a special discounted rate for the club. 20% of every sale will be donated to the club towards new equipment, etc.